Second only to peeking into our friends’ and coworkers’ fridges, we love swapping gear recommendations—for running, cycling, CrossFit, volleyball, soccer and more! We sat down with Vega National Educator and endurance runner Emma Andrews, RHN to find out her favorite running gear. To crush personal running goals, and get an accurate gauge of how your training is progressing, I consider a good watch to be an invaluable tool (or toy...). I love my Garmin Forerunner 620 for its ability to track in miles AND kilometers, transmit data to Garmin Connect Online automatically through WiFi (which can then synch with popular running apps on your phone like Strava). It also auto pauses when I am stopped at traffic lights, and displays multiple screens of data when I am running, including various pacing programs and heart rate zones. I find it takes no time at all to synch with satellites for accurate GPS straight from your doorstep. Find me on Garmin Connect or Strava and let’s share our progress! I run with my phone both for safety, as well for pump-up music. Spibelt clips easily under your clothes (the adjustable strap goes around your waist), and doesn’t bounce around as I run. On long runs I fit my gels, credit card, cash and keys in there too. I have tried A LOT of the sport headphones on the market and these are by far the best. They are comfortable, have great sound quality, and don’t pop out—even after mile 13. Want to know what I’m listening to? I shared some of my go-to racing tracks on a recent blog post or find my #runhappy playlists on Spotify. I wear compression sleeves on almost all my long runs, as I’ve found it helps keep my legs feeling fresh, and reduces swelling I can sometimes get in my ankles, particularly when endurance training on roads. Brooks shoes are by far some of the most comfortable and durable shoes I have worn. I am honored to be a Western Canada Ambassador for 2015, and the PureConnect are my go-to mid-distance road running shoe. Did you know all Brooks Running shoes are vegan (made without any animal derived materials)? Another fun fact, Brooks DNA cushioning technology is 30% more durable than other standard running shoe materials (gel or EVA), yet is 50x more biodegradable (i.e. in a shoe’s eventual resting place – the landfill). Almost as important as a perfect pair of running shoes! I’ve found the Essential Low Cut Lite socks from Brooks to be a perfect blend of breathability and comfort. Hot feet and rubbing fabric are both uncomfortable and unnecessary distractions from your run. This ergonomic handheld water bottle is lightweight and sleek so as to not affect my posture when running, but helps me manage my hydration on longer training runs (it comes with me on any run over 45 minutes). It fits 10ounces, which I fill with water and a serving of Vega Sport Electrolyte Hydrator Lemon Lime. Similarly to headphones, I have tried a lot of sunglasses over my years of running, and am picky about fit and functionality. Oakley has designed a fantastic line of stylish performance glasses, and understanding the female athlete, they’ve designed them not to slip when you sweat, and the nose tabs don’t get caught in your hair if they’re up on your head at any point. I love that they’re hassle free and keep you looking sharp. To fuel properly before, during and after my training, I always make sure my running bag has packets of Vega Sport Pre-Workout Energizer, Endurance Gel and Recovery Accelerator for convenient mixing in the parking lot, at the track or gym. Once I get home I make a post-workout meal, usually a high-protein, hearty salad bowl. Especially handy during winter running as you brave the elements. I avoid dry cracked lips (which sting from salty sweat during a hard workout) with Hurraw! Balm, based from almond, coconut and jojoba oils. 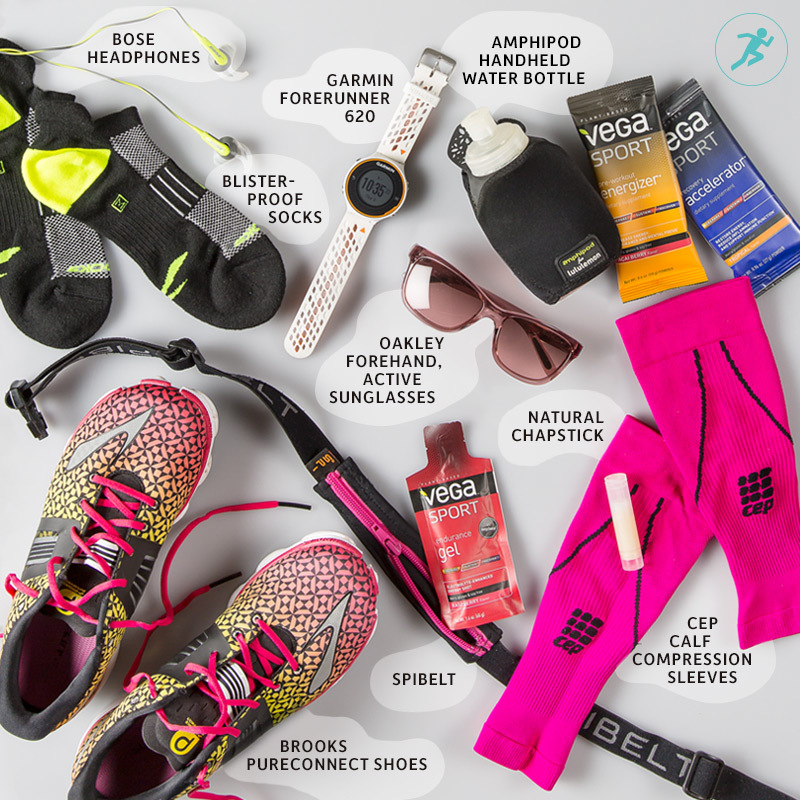 What’s in YOUR running bag?